Summer favorites are now available with discounts between 30% and 40% from original retail prices at Talbots retail stores in the U.S and online. Valid on selected styles. 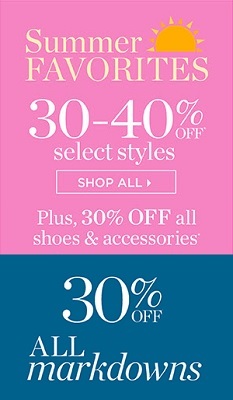 Plus, take 30% off all shoes & accessories. You can also take an extra 30% off all markdowns! Isn't it great? Source of the information is Talbots. Offer is valid now through June 20, 2016. For more details visit your nearest Talbots retail store location in the U.S. or Talbots online.